"It's too bad. But the comfort you've always felt at being called the strongest fighter in the galaxy will come to an end today. No more will the word "Saiyan" mean anything but failure." "Shadow Dragons Unite" "Shadow Dragons Unite"
The above info came from Marcus, and was edited by yours truly (contact me). During the battle with Syn Shenron, the most powerful of all shadow dragons, Goku unleashed his 10x kamehameha wave which it was thought to have destroyed him. Somehow Syn survived and summoned the remaining dragon balls to come to him and as he swallowed them all he transformed into the "ultimate evil dragon of absolute destruction", Omega Shenron. Omega Shenron isn't substantially different from Syn Shenron, in terms of looks but his horns on his body become more perked up and larger. 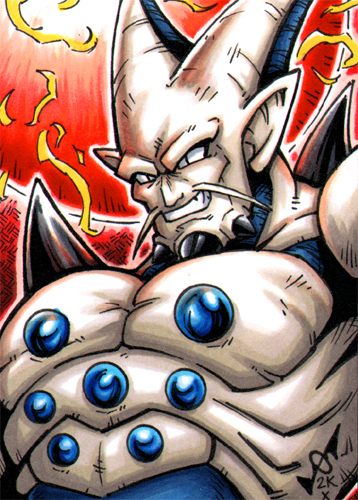 The dragon ball on his forehead is now protruding from his chest along with the other 6 dragon balls. His power level elevates to 10x that of super saiyan 4 Goku's. Omega Shenron's attacks can range from practically anything. He can steal bodies of whomever he pleases (he does this to Nova Shenron to avoid being killed in the nova sphere) by sending the dragon balls on his chest into the targets body, regenerate, use Dragon Thunder by trapping the foe with the spikes on his back and flooding them with electricity (he does this to Vegeta), Use Gigantic Blaze (an attack similar to the nova sphere, but used at a distance), freeze his foes with beams from his eyes, send vicious wind scythes hurling toward the foe, and every other attack that can be used by the shadow dragons. His power is so great, the only person who can match and surpass him is super saiyan 4 Gogeta who brushes him aside like an insect with his unrivaled power. Omega Shenron is so powerful, it takes Goku a spirit bomb created from the energy of every living thing in the universe to put him out for good. The above description came from Marcus, and was edited by yours truly (contact me).